A vertical face rub designed for effective and economical control of face flies, horn flies, lice, and ticks on cattle and other livestock. Aids in reduction of pinkeye and harmful external parasites. 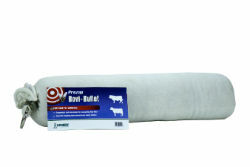 With a metal ring for easy hanging, the Prozap® Bovi-Bullet is ideal for use in mineral feeders. Superior insecticide charging and wicking action allows for low-stress application of insecticides on cattle. Initially charge with 1 liter of solution and recharge as necessary to maintain wetness.